Nothing looks quite as beautiful as a home that’s just been painted. It doesn’t matter whether it’s a brand new home or one that’s been renovated or spruced up, that immaculate paint job plays a big part in turning a house into a home. Lets’ face it, nothing looks finished until it has had that final coat of paint, and for residential painters Brisbane, it’s hard to go past the experience and quality of DR Paint. There is a lot more to painting than meets the eye, and more work actually goes into the preparation before a coat of paint is applied than the actual painting itself. If the preparation is not done right, the final result will be less than satisfactory and the results won’t last as long as they should. Repainting an old house will require a different preparation to that required for a new home. Dr Paint has the experience to do both to a top quality, professional standard where the results will shine for many years to come. The DR Paint prescription is: “If you are going to do it right, then do it right the first time”. Just like with anything else, residential painters are not all created equal. Some are better than others, and DR Paint is certainly high up in the ranks when choosing from the residential painters Brisbane has to offer. Coming from a family history of painters, dating back to his time spent growing up in a small country town in Central Queensland, Darran’s residential painting experience is vast to say the least. There is nothing Darran loves more than to see the smile on the face of a satisfied customer as they view the final results of his exemplary craftsmanship. A job well done is what it’s all about at the end of the day. For all your residential painting requirements – whether brand new homes or repaints – the Doctor has definitely got you covered. 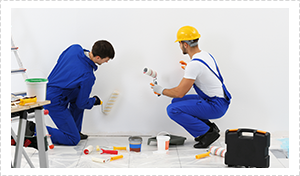 No Brisbane painting job is too big or too small for DR Paint, and even insurance repairs and roof restorations are our specialty. Get in touch today for a free quote. There is no obligation, but if you take on DR Paint, you are sure to get the job done right first time. Satisfaction is what the Doctor prescribes.